Autoworld, a local Santa Cruz auto rental company, was looking for a way to let people know about them. 'Working with Julia Hyde, of Persuasions Copywriting, on web site optimization was one part of the formula. The other part was having me redesign their website which was very confusing and difficult to use. 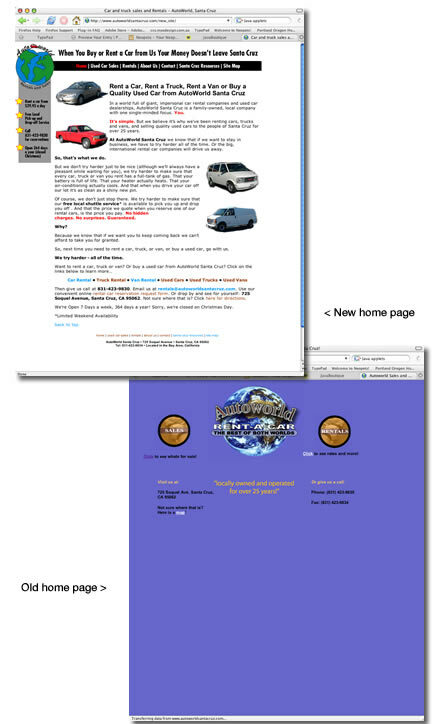 Although the original had a section for rental and buying, the new site made it clearer and also divided the vehicles by size and type. It turned out that the most popular vehicles to rent were the vans.